25 3/4 by 31 7/8 in. One of Legros’s – and indeed the mid-nineteenth century’s - most storied paintings, L’angelus was also the artist’s first major religious painting and a powerful example of his acclaimed Realist style. It was precisely this “sincere piety,” indebted to the Old Masters and revitalized by Legros, that drew the admiration of Baudelaire. This quality, the critic believed, along with the ability to transform the vulgar and the trivial into the moral and the grand, offered a promising path for Legros, and other artists who wished to create religious paintings for the modern age. [vii] In the figures’ unnatural flatness (they appear to be stuck to the background, like paper dolls in a tableau) and the perspectival aberrations of the room in which they prayed, Baudelaire found “charm,” intimacy, and a compelling look back to the childlike innocence of “old pictures.”[viii] At the same time, however, Legros’s care to render each and every detail, from imported cottons to an umbrella laid out as if in a shop window, and his brash, unforgiving figure-style (memorably described by one contemporary writer as “Pre-Raphaelite in its still intensity, with a dash of Courbet”),[ix] created a work as current as it was timeless. Haden’s “retouching” of Legros’s painting adds yet another (and this time literal) layer of interest and significance to L’angelus, and provides a dramatic example of what makes this one of the nineteenth century’s most compelling works. This “simple, precious masterpiece,”[xiv] the first of Legros’s quiet, seemingly self-contained church interiors, with figures absorbed in their own thoughts and practices, is in fact a palimpsest of competing and profoundly referential art historical narratives. With its seamless union of past and present, and its ability to shift between the antiquated and the avant-garde, L’angelus expresses the faith not merely of the kneeling women within its frame, but of the time and place in which they – and the artist who painted them - lived. The composition of L’angelus draws from other pictures and etchings in Legros’s oeuvre. It is similar to La Veillee Mortuaire (1859) with its tilting floor and flat figures, and the rigid horizontal format is also seen in Procession dans les Caveaux de St. Medard (1859). Legros likely worked from hired models and sketches of family members, many of whom were featured in later works: the woman standing above the rest in his famous Ex-Voto (1860, Dijon, Musée Des Beaux-Arts), for example, is the same figure as that on the right of L’angelus. According to the Academy, Legros also augmented the realism of this and other religious scenes by visiting a monastery in Paris, where he studied the monks “in all their household functions”: “He knew their particular physiognomy by heart, their gestures, the folds of their dresses . . .” (“M. Legros’ Etchings,” The Academy 10, July 22, 1876, p. 92). [i] Henri Fantin-Latour (1836-1904), Édouard Manet (1832-1883), Jean-François Millet (1814-1875), and James Abbott McNeill Whistler (1834-1903) were just a few of the surprising casualties. Amongst their works, L’angelus was considered “a violet among brambles,” (Zacharie Astruc, Les 14 stations du Salon - 1859, preface by George Sand, Paris, 1859 [see also Le Quart d’heure 4.10 (July 5, 1869), p. 56]). For more on the importance of the 1859 Salon, and the numerous criticisms leveled against it, see Henri Loyrette, “The Salon of 1859,” in Origins of Impressionism, Gary Tinterow and Henri Loyrette, exh. cat., New York, 1994, pp. 3-27. [ii] The American businessman Francis Edward Bliss (1847-1930) amassed an internationally acclaimed collection of etchings and paintings by Legros after 1905 – the largest of its kind. Asa Lingard (d.1957) was a wealthy department store merchant in Bradford, England; her expansive art collection included works by artists as diverse as Dante Gabriel Rossetti (1828-1882) and David Bomberg (1890-1957). For more on Bliss, see Frits Lugt, Les Marques des collections, Amsterdam, 1921, nos. 265 and 988 and Supplement. [iii] Known only through dated black and white photographs, the picture was believed lost for several decades. [iv] Edouard Hamman (1819-1888) also painted a picture entitled L’angelus in 1859 (sold by Goupil Oct 11, 1862, The Hague), further testifying to French audience’s penchant for the subject at this time. Even as late as 1881, the Art Journal could still describe Legros’s work as “popular in theme and religious in inspiration” (W.E. Henley, “Alphonse Legros,” The Art Journal, October 1881, p. 294). The angelus is a Catholic devotion commemorating the Incarnation, and is practiced by reciting Biblical verses and prayers in the morning, at noon, and in the evening. It is usually accompanied by the ringing of the Angelus bell. [v] Millet’s and Legros’s focus on French peasant life was representative of a broader European phenomenon, in which religious observances in country villages were seen as the last bastions of a pure, uncontaminated faith. 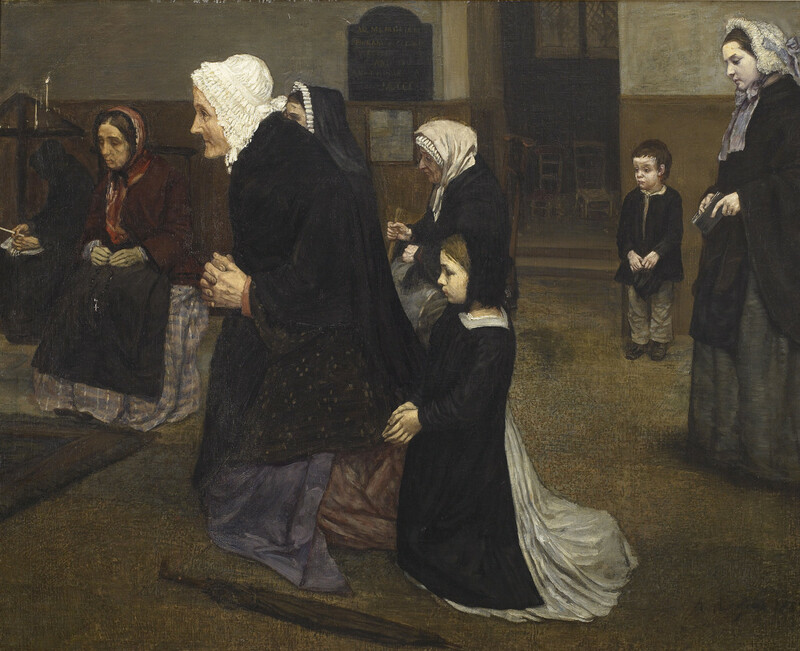 Rather than depicting any doctrines of the church, or any miraculous or historical events in ecclesiastical history, and not necessarily reflecting the personal beliefs of the artist, many of these modern religious paintings celebrated spiritual grace in the mundane realities of rural daily life, as well as in the most humble acts of prayer and ritual (see also in this regard the works of the French Realist painter Jules Breton [1827-1906]). Of L’angelus, one contemporary writer observed: “[I]n reproducing these monotonous lives, the least important actions of which have the regularity of clock-work, [Legros] avoids monotony, and discovers abundant variety of character,” (René Ménard, “Alphonse Legros,” The Portfolio, January 1875, p. 115). The focus on the peasant or working classes was also in keeping with the Realist philosophy, which sought to democratize art by depicting – often in gritty detail - modern subjects drawn from the everyday lives of the common laborer. This artistic tendency reflected trends in contemporary literature as well, particularly in the writings of Honoré de Balzac (1799-1850), Gustave Flaubert (1821-1880), and Émile Zola (1840-1902). [vi] For a similar, though far more concise sentiment, see “Current Exhibitions,” Athenaeum, July 6, 1912, p. 21. [vii] “J’ignore si MM. Legros et Amand Gautier possèdent la foi comme l’entend l’Eglise, mais très-certainement ils ont eu, en composant chacun un excellent ouvrage de piété, la foi suffisante pour l’objet en vue. Ils ont prouvé que, même au XIXe siècle, l’artiste peut produire un bon tableau de religion, pourvu que son imagination soit apte à s’élever jusque-là. (…),” (Charles Baudelaire, “Salon of 1859,” pp. 331-4, reprinted in Curiosités esthétiques, l’art romantique et autres oeuvres critiques, Paris, 1868, p. 277). [viii] “M. C … me fit remarquer que les fonds ne fuyaient pas assez loin et que les personnages semblaient un peu plaqués sur la décoration qui les entoure. Mais ce défaut, je l’avoue, en me rappelant l’ardente naïveté des vieux tableaux, fut pour moi comme un charme de plus. Dans une œuvre moins intime et moins pénétrante, il n’eût pas été tolerable,” (ibid., p. 279). In these qualities, Legros’s painting also reveals the strong influence of the nineteenth-century German Nazarenes or “primitives,” in whose works forms were flattened and the horizon line raised to provide a sense of recession unaided by the tools of Renaissance perspective. Perhaps influenced by Legros, whose works he already knew, Whistler too began to flatten his etched compositions in and after the summer of 1859 (cf. Nursemaid with Child [etched 1859, and his Thames etchings of same year). Alexander Seltzer also draws connections between Legros’s “primitive” art and that of the seventeenth-century LeNain brothers, newly rediscovered at mid-century, and modern artists of the Antwerp School (see Alexander Seltzer, Alphonse Legros: The Development of an Archaic Visual Vocabulary in 19th Century Art, Ph.D. Diss., State University of New York at Binghamton, 1980, pp. 116-25, 146, 147, 176, 283, 296-7, 301, 310, 421; and “Alphonse Legros: Waiting for the Ax to Fall,” Arts Magazine 62.5, January 1988, pp. 41, 43). [ix] “Artists Who Matter: XI. Alphonse Legros,” The International Interpreter, June 24, 1922, p. 371. Gustave Courbet (1819-1877) was a French Realist painter, whose “concrete realism” may have influenced Legros (“. . . painting is an essentially concrete art and can only consist in the representation of real and existing things,” Courbet, 1861). For a brief but informative summary of Realism, and the importance of Courbet to the movement, see http://www.metmuseum.org/toah/hd/rlsm/hd_rlsm.htm. [x] See Elizabeth Robins Pennell, Life of James McNeill Whistler, vol. 1, Philadelphia and London, 1908, pp. 77-8; and Pennell, The Whistler Journal, Philadelphia, 1921, pp. 79-80. [xi] Alexander Constantine Ionides (1810-1900) moved with his family to London after making his fortune in textiles. There he formed friendships with numerous artists, including, at Whistler’s urging, Legros. Constantine would become one of Legros’s most avid and dependable patrons; Legros, in turn, began to act as an advisor for his fine art purchases. The Ionides collection was donated to the Victoria & Albert Museum in London in 1901. [xii] Elizabeth Pennell provides a fairly benign account of the events leading up to this fateful day: “Legros had, before coming, sold a Church Interior to Haden, who liked it though he found the floor out of perspective. One day he took it to the room upstairs where he did his etchings and turned the key. When it reappeared, the floor was in perspective according to Haden. A gorgeous frame was bought and the picture was hung conspicuously in the drawing-room. Whistler thought Haden restive when he heard that Legros was coming, but nothing was said. The first day Legros was impressed; he had been accustomed to seeing himself in cheap frames, if in any frame at all. But gradually he looked inside the frame, and Haden’s work dawned upon him,” (Elizabeth Robins Pennell, Life of James McNeill Whistler, vol. 1, Philadelphia and London, 1908, pp. 77-8; and Pennell, The Whistler Journal, Philadelphia, 1921, pp. 79-80). [xiii] James McNeill Whistler, Letter to Henri Fantin-Latour, [c. January 4-February 3, 1864], Library of Congress, Washington, D.C., Manuscript Division, Pennell-Whistler Collection, PWC 1/33/15; accessed online on December 5, 2016:http://www.whistler.arts.gla.ac.uk/correspondence/people/display/?rs=26&nameid=Legros_A&sr=0&initial=L (see also Nigel Thorp, ed., Whistler on Art: Selected Letters and Writings, Manchester, 1994, pp. 13-16, p. 174 n. 8). [xiv] Léonce Bénédite, “Alphonse Legros, Painter and Sculptor,” The Studio 29, 1903, p. 12.